Cindy Needham: The Nun's Quilt...the "Rest of The Story"
The Nun's Quilt...the "Rest of The Story"
I think it's safe to say that anyone who has been a blog follower, taken a workshop/class or been a guest at one of my guild programs has been touched by The Nun's Quilt. This special linen came into my life on Christmas Eve day 2010. From the time I saw a picture of the linen on Ebay, to the time I received it, and during the hundreds of hours devoted to quilting it...I knew it was special. I have devoted nearly two years researching this linen to find out which convent it originated from as I felt this quilt needed to be returned to France...specifically to the convent from which it originated. There were absolutely no leads from hundreds of contacts. Chantal Cholin from France took up the cause and just this past week revealed what we believe to be a fairly accurate history. 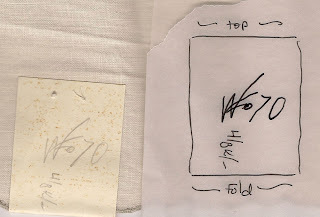 In order to avoid duplicating a lot of information here, I have included what will be the NEW label that will be placed on the back of the quilt. This beautiful linen was purchased off of Ebay on Christmas Eve day, 2010. 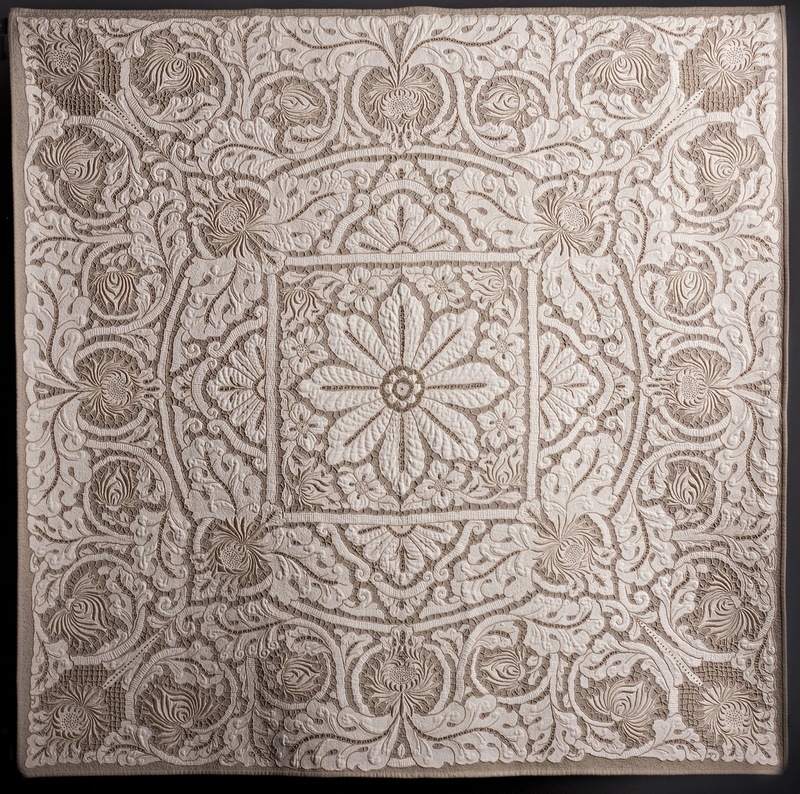 The history that accompanied it stated it was hand made by nuns in a French convent in the early 1940’s It also came with six beautiful napkins. 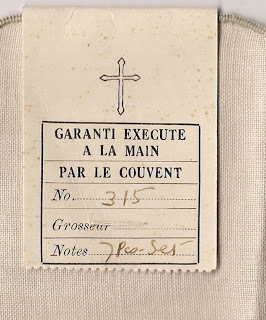 Both the table linen and one of the napkins came with a label with a cross and in French writing stating “Garanti Execute A LaMain Par Le Couvent” meaning it was “guaranteed executed by hand in a convent”. 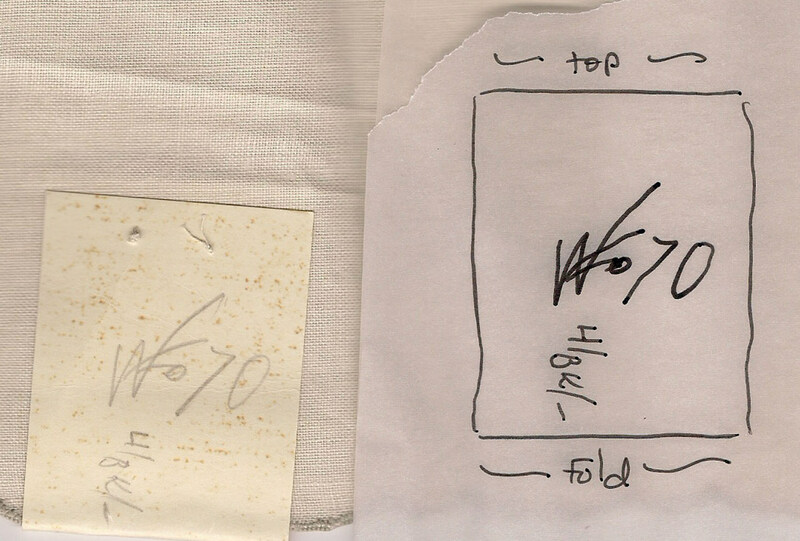 Special symbols were handwritten on the back of the label. 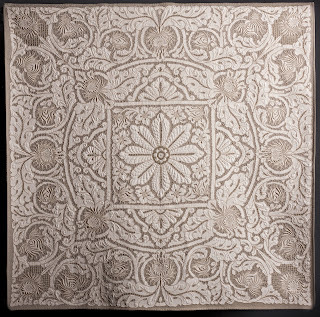 I meticulously machine quilted and hand beaded this linen in 2011. I would estimate my invested time at about 800 hours…at least. This piece has a presence or a soul and I felt it while working on it and still feel it today…others do too. I felt a strong conviction to research the linen’s history and find out which convent it came from. I felt it should be returned back to the particular convent that created it. A full year’s research with many contacts being made worldwide resulted in no leads revealing the linen’s origination. To my dismay I did find out that this linen was likely created during the war and I was very upset when I discovered the terrible things that had happened to the nuns during this time. 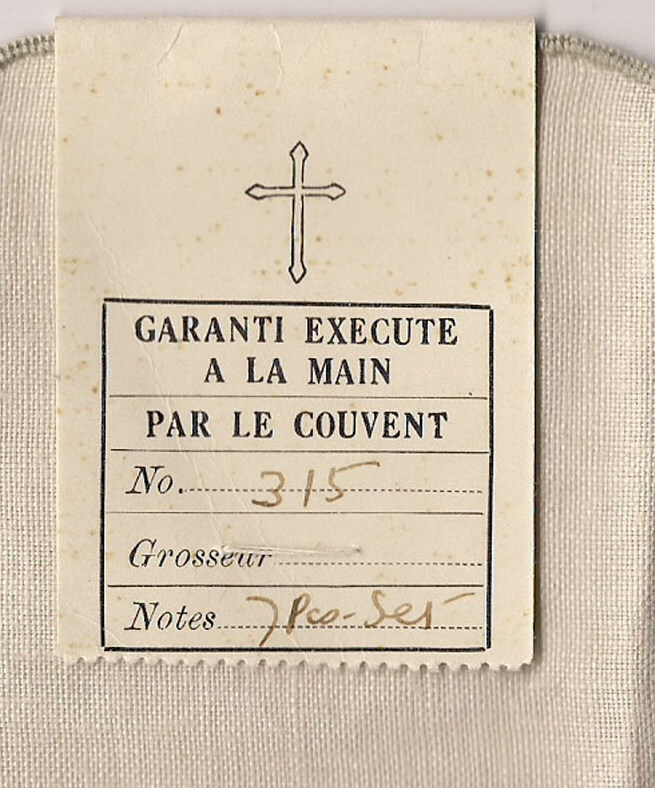 “Sister Marie Emmanuel told me that this tablecloth was probably made before the war or during the war. The sisters had time to elaborate very beautiful crafts. The upper and middle class people were buying them…it was part of the French traditions and French way of life. After the war the hard time began. The middle class people had no more money to spend on such things. The religious communities needed money as well to survive. In 1950 the first Monastic shop in Paris, France was opened. I allow myself to tell you that the Nun’s Quilt is now yours. You have been working on it so many hours. Now you know that this Art Embroidery has been made in happiness and in the sweet protection of a monastery. You must keep it as a “porte bonheur” (bring luck)”. So beautiful. Have taken close up pics to share? I believe it is safe to say the quilt has been "home" for awhile now. And it truly means something that you found it on Christmas Eve. Who better to be the new custodian of this wonderful piece of art? Keep it close! Exquisite! Thank you for sharing! I, too, have a love for old linens. une belle histoire, pour une œuvre magnifique et certainement faite avec amour. Merci de nous la partager..c'est un cadeau pour nous. What a moving story. I am happy for you for a happy ending. My curiosity was piqued when reading about the opening of the first monastic shop in Paris. A Google search resulted in this link: http://www.artisanatmonastique.com/linges-anciens-dentelles.htm. The pictures shown on this page of the website are of old linens that I assume are for sale. When I manage to go to Paris, I will want to spen time in that shop!